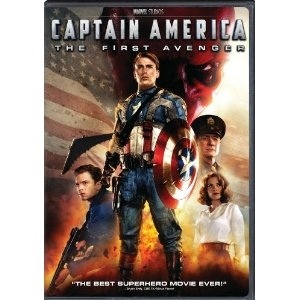 Captain America: First Avenger on DVD today! No, Captain America hasn’t been rolled into the G.I. Joe brand– but today is the release date for one of the best and most fun super hero movies I’ve seen in a good long while. Captain America: First Avenger drops into stores today in both DVD and BLU-Ray versions. If you’re looking for a good old-fashioned comic movie where the hero is an example to all, this is the film for you. Plus, the figure line is practically in scale with the new Joes! Who doesn’t want to see Cap leading a group of Steel Brigade troopers through a door to bust some Cobra heads? Paramount Pictures introduce the latest addition to the incomparable Marvel Super Hero team with CAPTAIN AMERICA: The First Avenger, ready for action on high definition Blu-ray 3D, Blu-ray and DVD October 25, 2011. Called “the best superhero movie ever” (Brian Erdy, CBS-TV), the thrill-packed adventure is a blockbuster hit with audiences worldwide, earning over $350 million at the Global Box Office. When a terrifying force threatens everyone across the globe, the world’s greatest soldier wages war on the evil HYDRA organization, led by the villainous Red Skull. Loaded with fantastic action, stunning visual effects and an awe-inspiring hero imbued with courage, humanity and an unbreakable spirit, CAPTAIN AMERICA: The First Avenger transports viewers into a world of daring exploits and excitement. Starring Chris Evans in the title role, the film features an outstanding ensemble cast including Academy Award®-winner Tommy Lee Jones, Hugo Weaving as Marvel’s Ultimate Villain, Red Skull, Dominic Cooper, Neal McDonough, Derek Luke and Stanley Tucci. Blu-ray in high-definition 3D and in high definition 2D, as well as on standard definition DVD with a digital copy. The two-disc Blu-ray/DVD combo pack includes a high definition presentation of the film, plus a standard definition presentation with a digital copy. Both sets boast over an hour of behind-the-scenes bonus material including an original Marvel short film, an exclusive sneak peek into the ultimate Super Hero team, Marvel’s The Avengers, six featurettes that go behind-the-scenes of the filmmaking process, deleted scenes and much more.